Your Luminiart illuminated sculpture was inspired by the art and landscape of Oberammergau, Germany, a tiny hamlet in the Bavarian Alps. Oberammergau is situated in a wide valley, surrounded by forests, mountains and meadows. The Luminiart nativity portrays such a setting, with deer moving through dense woodland. Except for the star in the night sky, there are no clues as to what you will discover within. Depress the light switch, then slowly open the forest doors. A visual feast presents itself that is both liturgical and theatrical. Oberammergau is world-renowned for its annual pasion play, a vast six-hour spectacle. 2200 people from this small German town, population 5350, participate in the production. Oberammergau is also acclaimed for its wood carvings, most notably holy statuary and elaborate creches, that date back as far as the Middle Ages. Your Luminiart sculpture takes both its thematic and stylistic inspiration from this statuary. Notice the birds, hovering high above the trees, like angels. At this moment forest foes are friends and peace reigns as all drink from the water that springs at the Christ child’s feet. We invite your imagination to travel to the Bavarian hamlet of Oberammergau, where the beauty of nature merges with the sacred arts. Artist Robert Olszewski is pleased to unveil their latest collaboration: hand-carved, highly ornate, illuminated sculptures that are wholly unique and truly awe-inspiring. Each Luminiart™ sculpture depicts an iconic structure. Crafted in crushed marble and hand-painted and tinted, every piece has a “magical” portal that opens to reveal an ornate interior scene, lit up with twinkling lights. Your Luminiart illimunated sculpture was inspired by the art and landscape of Oberammergau, Germany, a tiny hamlet in the Bavarian Alps. Oberammergau is situated in a wide valley, surrounded by forests, mountains and meadows. 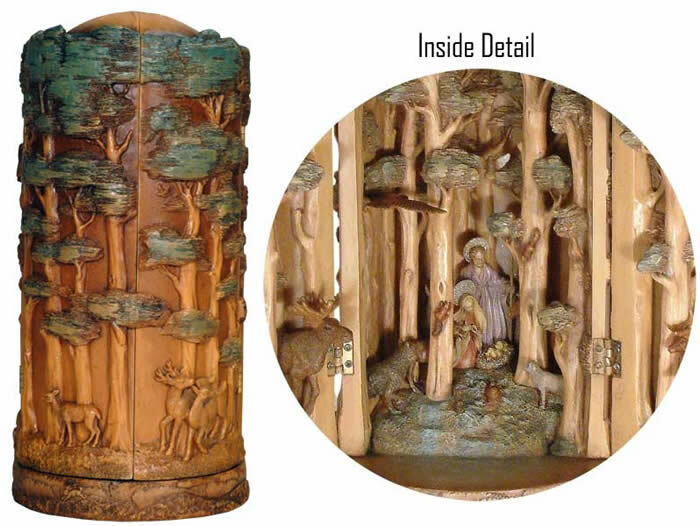 The Luminiart nativity portrays such a setting, with deer moving through dense woodland. Except for the star in the night sky, there are no clues as to what you will discover within. Depress the light switch, then slowly open the forest doors. A visual feast presents itself that is both liturgical and theatrical. Oberammergau is world-renowned for its annual pasion play, a vast six-hour spectacle. 2200 people from this small German town, population 5350, participate in the production. Oberammergau is also acclaimed for its wood carvings, most notably holy statuary and elaborate creches, that date back as far as the Middle Ages. Your Luminiart sculpture takes both its thematic and stylistic inspiration from this statuary. Notice the birds, hovering high above the trees, like angels. At this moment forest foes are friends and peace reigns as all drink from the water that springs at the Christ child’s feet. We invite your imagination to travel to the Bavarian hamlet of Oberammergau, where the beauty of nature merges with the sacred arts.